Much has been made of umpire Angel Hernandez's botching of replay review in last night's Oakland-Cleveland game, a mistake that might have cost the A's the game. You've doubtless already seen the play numerous times on your home TV or computer screen, but you've probably never seen it the way Hernandez did—or how every MLB crew chief does when going to the replay booth. 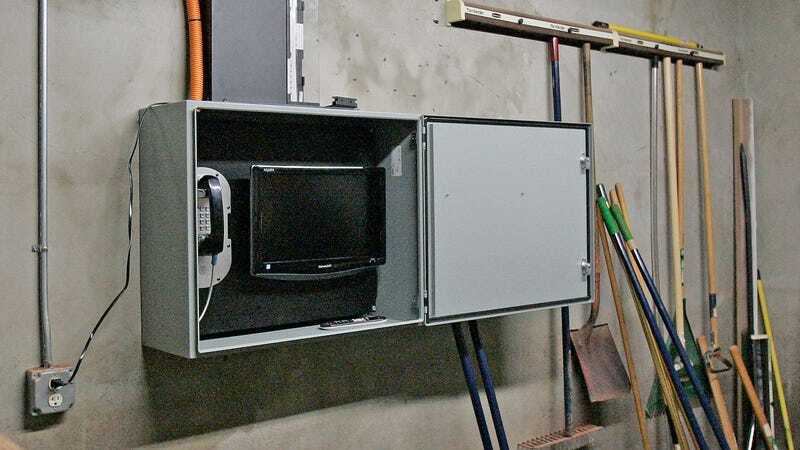 The image you see above is an actual Major League Baseball in-stadium replay system as used by umpires. It's pretty simple, consisting of a "secure" phone line to MLB's offices in New York, a 19" television, and a fiber optic connection streaming digitized video curated by the league's video wizards. Slap an industrial grey box around it and it's the height of technology, MLB-wise. Of course, you probably have a TV bigger than 19" at home—it's more than likely you're reading this on a bigger screen, too. (NFL officials, by comparison, have utilized 26" monitors since 2007.) Surely Major League Baseball invested in the highest-quality broadcast-level monitors available to ensure umpires have the best picture, though, right? Wrong. MLB uses the Sharp Aquos models not because of their quality but because Sharp paid the league an unknown sum of money to become its official TV sponsor. (The MLB Advanced Media brain center was also outfitted entirely by Sharp Aquos televisions as opposed to broadcast-standard monitors.) The Sharp Aquos 19" monitor isn't capable of full HD resolution, so when MLBAM executive VP Dinn Mann claimed umps see the "same video in HD" that fans viewing at home do, he wasn't being honest. Most of what we know about how MLB handles replay comes from 2008, when the system was first implemented. They haven't talked about any changes since then, and when we asked very specific questions about the technology used a league official politely declined to answer any of them. It's possible they have larger screens (and ones from Samsung, the new MLBAM official sponsor) but MLB didn't confirm anything of the sort when we asked—and we can't find any evidence the system's technology has been revamped at all, something you'd assume the league would trumpet in support of its sponsor.